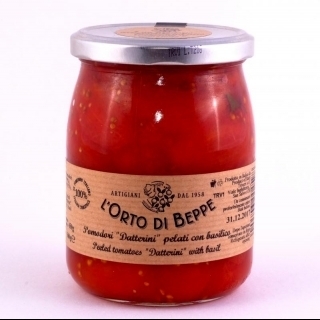 Simply delicious - that's the only way to describe an authentic tomato sauce which remains true to its origins. Naturally sweet datterini cherry plum tomatoes, basil and a touch of Abruzzian magic make homely ingredients into a sauce fit for royalty. The little tomatoes have fewer seeds than other varieties, plus high acidity which transforms into a delightfully sweet taste when cooked. The sauce is so versatile too, making it an invaluable larder staple. It goes well with a range of meat, fish and vegetable ingredients. Try with Organic Caserecce Pasta di Semola and Cured Sardinian Sausage for a feast of complementary flavours. Or with Pappardelle and meatballs for a hearty winter dinner. Eaten straight with pasta and some Sardinian flatbread, this 100% natural, preservative-free cherry plum tomato sauce makes an ideal ingredient for a lunch or supper dish.